The following is a letter from the Real Estate Board of New York to NYC landlords in anticipation of any expiration of the rent laws. For a graphic view of the actual letter, click here. We previously asked you to keep your tenants informed about the progress in Albany toward a compromise on rent regulation. The most important phase of the campaign is about to begin and we are counting on your help. If the New York State Senate and Assembly do not both pass the same residential rent law before June 15th, rent stabilization will lapse but, in all probability, only temporarily. We fully anticipate that negotiations will ultimately produce a compromise bill which is likely to be retroactive. Should the rent laws expire, it will not impact current leases while they are in effect, or rent controlled tenants, or rent stabilized tenants or their successors who have been in continous occupancy since July 1, 1971. Continue to offer lease renewals during the lapse 120 days prior to the expiration of the current lease. 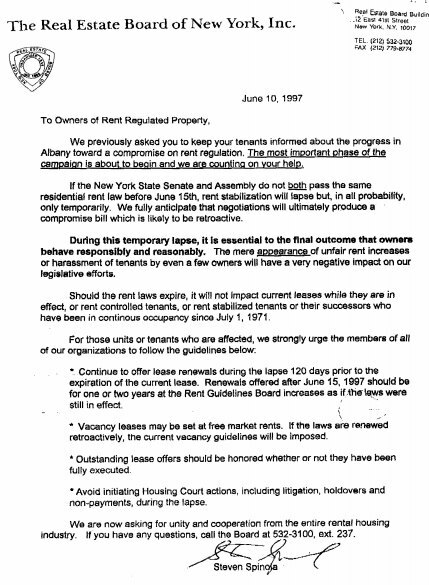 Renewals offered after June 15, 1997 should be for one or two years at the Rent Guidelines Board increases as if the laws were still in effect. Vacancy leases may be set at free market rents. If the laws are renewed retroactively, the current vacancy guidelines will be imposed. Outstanding lease offers should be honored whether or not they have been fully executed. Avoid initiating Housing Court actions, including litigation, holdovers and non-payments, during the lapse. We are now asking for unity and cooperation from the entire rental housing industry If you have any questions, call the Board at 532-3100, ext. 237.